Well we made it out this past weekend. Last campout of the year…. . The stars all lined up. The weather cooperated, had the time off work, the kids where at their homes and DW did not have to baby sit the grand kids, Where gone…. .
No bugs, no crowds, reduced rates, can’t beat it. Ever have a 250 campsite state park almost all to yourself? It’s great! These camp site shots are not as nice as Emans out west, but they sure beat Cyber camping. I’m sure we will now go back into hibernation until all the stars line up again… Hopefully it is not more then a month like the last stretch. The camping fever gets pretty high around these here parts. Have a happy new year. Just thought we would share our weekend with ya. The other side. Starting to cook dinner. Just “chilling” by the campfire. Your photos really give me the itch to get out no matter the weather! Do you just not use the water system? We have a porta potti, dish pans, etc. from our PUP days. Yes, the camper is winterized. We bring drinking water from home in ½ gallon used juice bottles. Have 6 of them. Lasts 2 days of drinking/cooking no problem. We also have some small dish tubs that go in the sink for hands, face washing etc. To do dishes, we do them outside in dish tubs. Heat water on stove, pour in tubs, wash away. Have 3 gallon water jugs and fill them up at the park for outside water. We are also semi selective on the camp grounds. This one we went to this past weekend had a heated shower bath, with sit down toilets. The other parks we go to, while they do not have the heated shower house, do have a winter full time porta potty. State park rules. For the middle of the night runs…. We do have our little porta potty left over from the PU. So you guessed it right on. There is not that much different to do for a weekend get away. Days are in the 35 F or above. No heavy rain forecasted, no mega winds. No snow on the way to camp or in the forecast. If sun comes along, that is icing on the cake. Inside: You have to vent the camper, especially at night to let the moisture out or else you will have water on the walls issues. This year, we tooks Emans’ tip and added the shrink plastic to the windows. A major help but you still have to vent. We have the freezable items, foods stuff etc already to go in a few boxes. So when the right weekend comes, we pack faster then we do in the summer… and yes you have to bring warmer clothes to wear outside and to sleep in. The biggest thing to line up is the weather. It could be a week wait or 2 months…. This time is was 6 weeks and it was painful. We gave up one camping weekend to get the new TV, so I can’t complain too much. Try it. You will like it. Just be prepared. I'll bet Tweety is just begging to get out to the camp ground. Glad you had another chance to get out and use the Sunline. I haven't used the shrink wrap on my Sunny, yet !. But, I think it is definately something I wll consider. I am waiting to hear how you and Pat fair with the removal of the film and it's tape. I left home Dec 26th and returned on the 30th. Weather was mild, I was about 50 miles east of Lynchburg, VA camped in a friends yard. I was able to leave Sunny winterized, so basically only used at night to sleep in and a place for the dogs (2 weiners & my greyhound) to stay during they day as they could not go into friends house. I used only the heat strip that I had factory installed. It is thermostatically controlled and worked well. Something I did notice was the basic lack of condensation, even with the roof vent closed. I am curious about this? On my previous Sunlines, the AC was not ducted, so the heat strips put out heat thru the vents on the unit, maybe thats the difference? SO, now like you Sunny is home waiting for March 21st to arrive, when I will head to Walterboro, SC for a GTG with the Opens Roads Singles group, UNLESS a long nice weekend happens to come up. But, I think it is definitely something I will consider. I am waiting to hear how you and Pat fair with the removal of the film and it's tape. I used only the heat strip that I had factory installed. It is thermostatically controlled and worked well. Something I did notice was the basic lack of condensation, even with the roof vent closed. I am curious about this? On my previous Sunlines, the AC was not ducted, so the heat strips put out heat thru the vents on the unit, maybe thats the difference? Yes, I will report back on the tape removal. If it’s an issue, I will have a big issue…. There are a lot of windows in the T310. In fact the tape kept lifting as I was installing it. Had to keep pressing down hard to get it to stick. Do not know yet if it turns sticker over time. I’ll report back. To the moisture, h’mm. What night temps did you have? Warm days, 35 and above, followed by cold nights, 32 and below, and activity inside during the day is what brings the moisture. Especially any type of cooking or night time breathing by 2 adults. When the camper is sitting here in the yard, the moisture problem does not exist so much. No one is in it, it warms up slow by the sun and things seem to equalize out. It seems it is when someone try’s to live inside that the larger issues come. The heat strip, some day can you get some pic’s and brand? I may look into this. I cannot figure out how the heat strip would affect the moisture one way or the other. I have the little ceramic heaters and they put out heat similar to the heat strip, just from the floor. The moisture, if it is present has to go somewhere. Hey John, glad to see that you could get out one last time. I could only imagine what you all must be going through to not be able to use your Sunlines over the winter. Once question I have is why dont you all use your water during your winter camping? 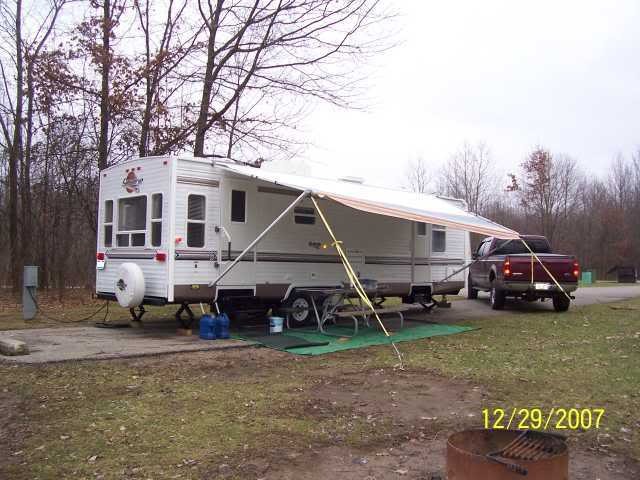 As long as you have tank heaters and are staying in a campground that you have electric available, then what is the issue? A simple blowout when you leave and you should be good? But then again, we've been in ours full time since we got it, so we've never gone through this process. As for an update on the window treatments, we only put them on the two big windows in the back side of the 2499. The one behind the couch, and the large one on the back of the coach. So far, we have had no condensation on either of the windows with the treatment on them, but any window we didnt cover still has condensation on it in the morning. No matter if we leave the vent open or not. We have noticed that leaving the vent cracked helps out big time with the moisture during the daytime and during cooking. We do 99% of our cooking indoors which I know is not normal for campers. I'll update when we try to pull it off if it leaves any residue, but like john said, being as it was stuck on aluminum frame, I'm not too worried about getting it off. Once question I have is why don’t you all use your water during your winter camping? 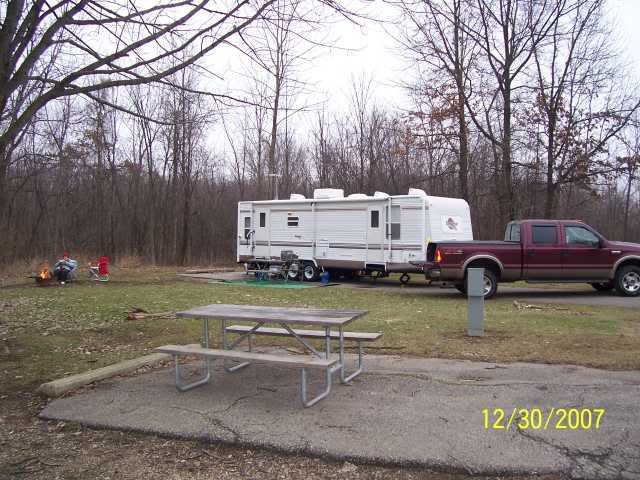 As long as you have tank heaters and are staying in a campground that you have electric available, then what is the issue? A simple blowout when you leave and you should be good? But then again, we've been in ours full time since we got it, so we've never gone through this process. I could of went wet this past time. But rather then pressing my luck, we didn’t. My camper I believe has what is known as enclosed tanks for extended camping season. Since Sunline is not at the other end of the phone to ask, I did not want to press my luck until next spring when I drop the tank enclosure down and see what is inside. I will close up a few of the big holes still there, add some more foam insulation and add a air temp gage to the compartment so I know what is going on. I have not found anyone with this feature that has used it in cold weather to see how cold, cold is. Now if this was our T2499 with exposed tanks. There is more to it then just the tank heaters. The drain elbows up to the slider valves and the supply fresh supply hoses are exposed as well. Yes I know it can be done, but it will take some extra work above the tank heater. If we camp when the ground is still warm, it is above freezing during the day and we get a freeze at night then followed by 40 - 45 F the next day, this we can make it thru as the camper itself radiates, ground radiates heat even on the T2499. This is if it only get down to like 28. Now to the blow out at home, this is a process if you want to go the total dry method for freeze protection. 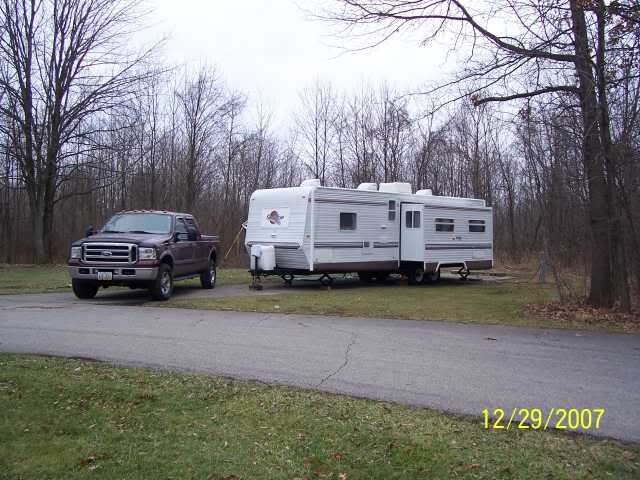 Each camper is piped different and how it is piped makes it a little more complex or not to blow out. I redid the T2499 to blow from the pump area which then did almost all the camper forward. But for freeze proof, you still have to blow out the pump. The T310 is not yet set up for quick blow, will be soon. I drain and blow out the system each trip even during the summer for micro concerns. Basically putting it, to lessen the 30 to 40 minute hassle with the way the T130 is setup, we just went dry camping so I would not be worrying about it each night. I lost an engine block one year in a farm dozer due to a freak hard snap only 1 night in early October and will never forget it… So I may be more temperature sensitive then others. As far as the windows, I’ll open a separate post on that one. I have more to add. Steve has MLK day off and his ski club doesn't ski on holiday weekends. I'm hoping for nice weather to head down to Old Mill Stream in Lancaster. French Creek is open too, but it's totally wooded, and I'm thinking sunshine is preferable on a winter weekend. There isn't much open around here at this time of year.